In the pre-market update of February 14, I anticipated that 1514 would become an important short-term support level, and so far the market's bounced twice from that level. I'm going to use this opportunity to unveil a bit of the "magic" behind technical analysis, and discuss some of the logic behind it, and a few of the reasons why anticipating future price action based on technical analysis works more often than it doesn't. The 10-minute SPX chart now sports a pretty decent triangle consolidation, which has been formed with two rejections at the 1524 level, and two bounces off the 1514 level (see chart below). 1514 has been tested several times now, and support becomes more important each time it's tested. In a moment I'll discuss why. I'll also discuss why we can further anticipate that this is now quite likely to have turned into a market where additional buyers will show up at higher prices, while additional sellers will arrive at lower prices. Everybody knows the rule that support tends to become resistance and vice-versa, but I don't know if everyone has thought through why this happens. Investors who think that technical analysis is some kind of "voodoo" clearly haven't thought much about it, but it's all very interesting to me from a psychological standpoint. Let's say the market is moving down to test support. As it hits support, bulls are buying, which usually causes the market to bounce, especially on the first test of support, and sometimes on the second test or beyond. But, obviously, it doesn't bounce every time (if it did, of course, then trading would be ridiculously easy). On the times that support fails, we end up with many of the bulls who bought the level earlier now trapped at a loss -- particularly the ones who bought on that last leg down, just before support broke. When support fails, the breaks are usually fast, and trap more than a few people, since most traders won't put their stops that close (unless they're scalping; nobody wants to get whipsawed out by a few points). Shortly after the break, the majority of the time the market rallies back up to the zone that broke -- so if you bought it earlier, you have a decision to make: do you take the chance to exit very close to break-even, or do you stay long and strong with your original stop? If enough of the trapped bulls do decide to take that exit, then that prior support zone becomes resistance, as the market gets hit with a wall of sell orders on the rally. If the bulls are of high conviction and don't sell, or if the market has simply exhausted its sellers (sometimes "too many" stops are run when the break happens, and you end up with traders chasing back into their original positions), then you get a whipsaw. Let's study a real-life example, using the 10-minute S&P 500 (SPX) chart. When we study this chart a little more closely, we can see that sellers came in at 1514 in a pretty big way on two occasions during the first week of February (on the way up). Unfortunately for some sellers, due to the gap up on February 8, it's a fair bet that any sellers who came late to the party got trapped short. We can then see the back-test of 1514 on February 11, and further reason that some of those trapped sellers surely elected to cover their positions -- but it's unlikely that all of them did. SPX has only moved up about 10 points since then, so it's also a reasonable bet that a fair number of swing-trader bears are still holding onto their shorts. 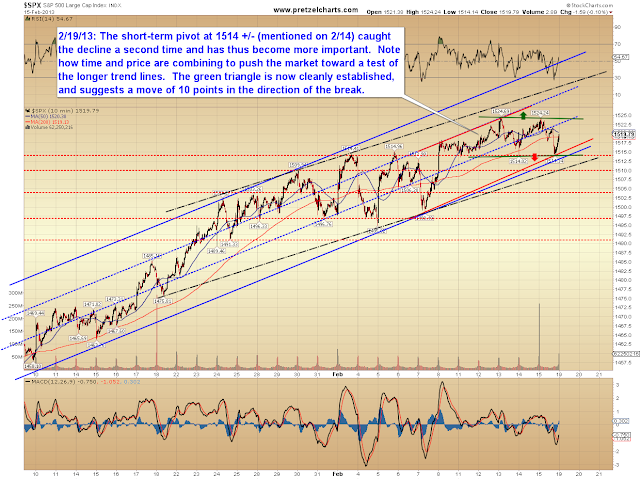 Looking to the upside, 1525 has rejected the advance twice, and thus now becomes an obvious stop-loss level for shorts. Typically, most traders will leave a bit of cushion beyond the obvious level, so we should assume 1525 plus a few points. The chart also shows us that ever since February 8, the market has been in a battle between buyers and sellers -- the pinball back and forth action tells us that bulls and bears are pretty equally balanced in this zone. 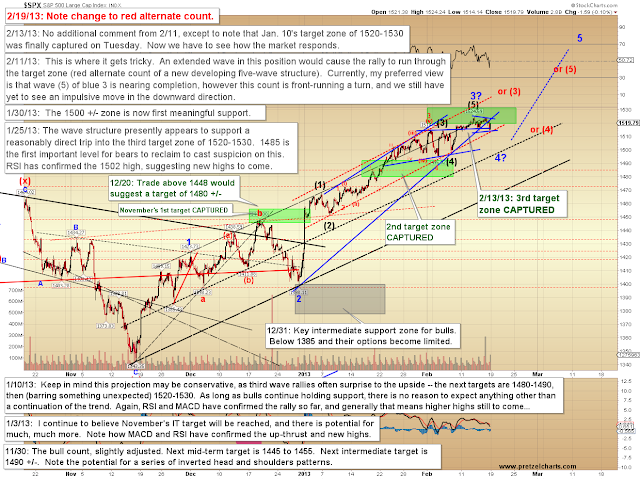 And that then tells us another piece of information about 1525: if the market does more than take a quick peek above that level, additional buyers should show up in the form of short covering (and possibly also in the form of bulls who are hoping to buy in lower, but will feel the urge to chase a break higher). The reverse is true of 1514 on the downside: 1514 (minus a few points) has become an obvious stop-loss level, so we can make a reasonable assumption that additional sellers will show up below that level. This is why the triangle breakout or breakdown can be projected to run at least 10 points. So, sustained trade beneath 1514 is very likely to lead to a test of the next support shelf, in the 1495-1500 zone, where buyers are likely to show up again. 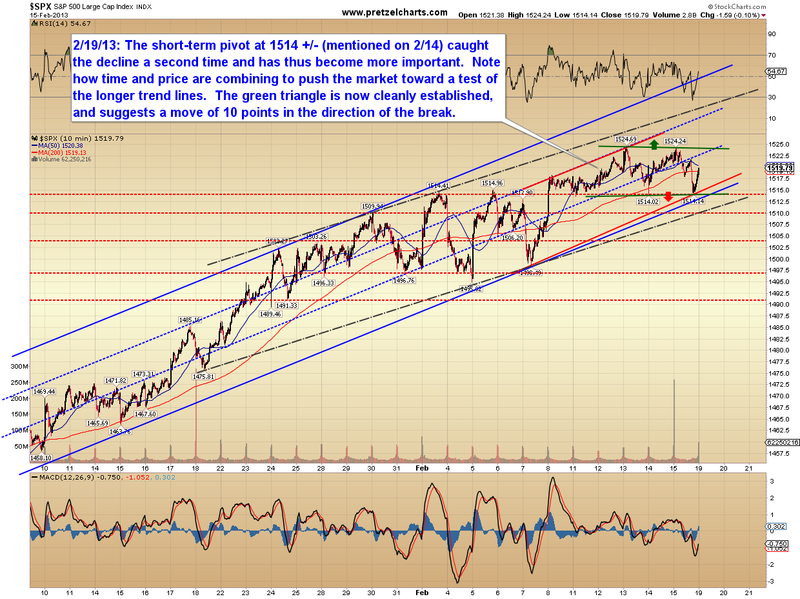 Sustained trade above 1525 is likely to lead to 1535 (+/-), where many short-term traders will take profits. Technical analysis really isn't a bunch of voodoo, it's simply based on trader psychology. Quite frankly, this is always my least favorite portion of a wave. It's clear that the market is unwinding a series of fourth wave corrections and fifth wave rallies, but it's unclear how many are left to unwind at micro degree. I still expect there is a larger fourth and fifth wave to unwind, shown on the chart below at blue degree (blue 4 and 5), and it's further possible that my black (4) and (5) labels are premature. If the market maintains support at 1514 and blue wave 4 doesn't unwind here, the next probable upside target for black (3) becomes the 1535 +/- zone, while the next probable target for the peak of blue 3 becomes 1555-1565. Accordingly, I've adjusted the alternate count to reflect this shift in preference, and (here's a confusing statement) the alternate count is actually preferred as long as 1514 holds any declines. The red "or (5)" label would then reflect the top of blue wave 3 -- so basically, trade above 1525 would shift the entire structure to the right at least one degree. Finally, a quick update on the Philadelphia Bank Index (BKX), sans chart (French, literally: "I ran out of time after the lengthy technical analysis discussion."). BKX did find a new low, however, it is presently unclear if the new low marks a larger ABC correction. Looks like the SP500 is headed for the 1535-1550 zone next. 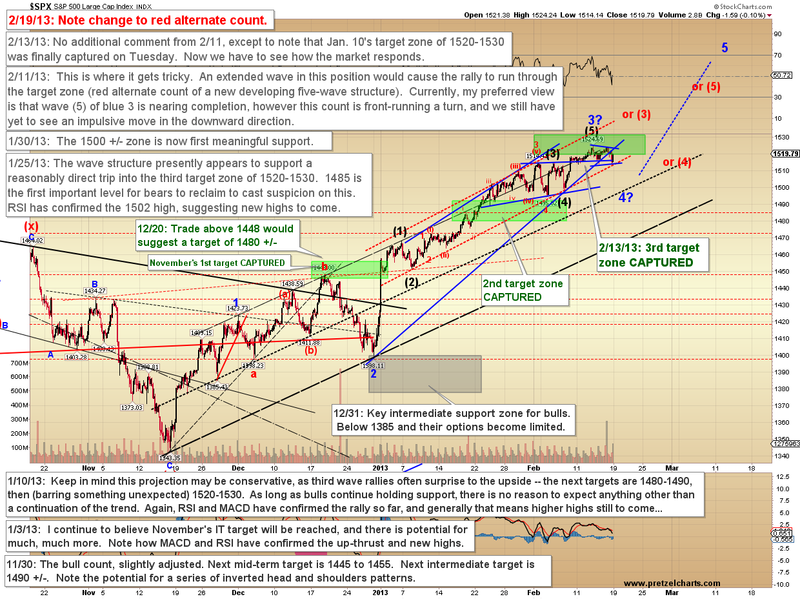 Starting to think I was too conservative in my 1600 upside target. Aren't bubbles wonderful ?? ?